The hard truth for many photographers is that they spend more time behind their computer editing pictures than they are shooting them. In the last few years I also noticed that I am spending more time behind my computer editing pictures and writing posts for LightingRumours. As consequence I noticed that these prolonged periods behind my computer were taking toll on my comfort. By following up some tips on the internet about an ergonomic work place I managed to improve the situation quite a lot, but I had the feeling that it could be further improved. So I started my quest to improve ergonomics during the editing of photos. It might seem rather obvious, but staring at a bright monitor in a dim room is not a good thing to do. Rapidly changing images can cause eye strain due to the fact that the pupil has to keep adjusting. More gradual changes would decrease the discomfort since the pupil has to adjust less quickly (which occur for instance when culling through photos). Also by increasing the size of the light source it is possible to get a more pleasant viewing experience since we are not looking into a small bright light source. Some people already understood that I was talking about the effect that Ambilight TVs are trying to achieve. By projecting similar colours on the wall as are displayed on the TV it is possible to give users the feeling the size of the TV is bigger than it actually is in reality. The projections are smoothed, meaning that they change less quickly as on the screen. Ambilight manages to achieve increase the viewing comfort, but does only so for TVs. It would be wonderful if the same effect could be achieved with computers. Lightpack is one of the solutions that is able to do so. The idea itself has been around since 2011 and 2013 a Kickstarter project was created in order to get the technology available to the people. 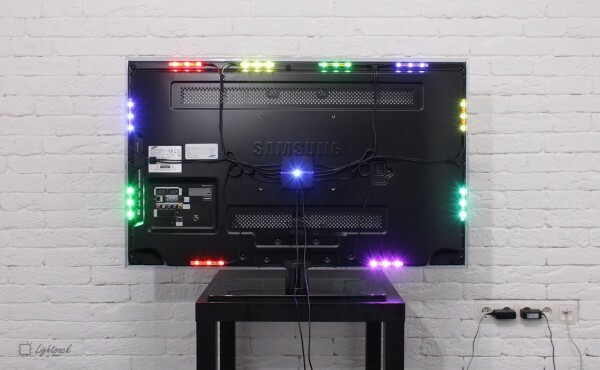 Lightpack consists of a master board, additional RGB LEDs, firmware that manages hardware and the image capture software called Prismatik installed in PC. The software figures out an average colour of the image displayed on the screen for every capture area corresponded to one LED. After that the colour data is transferred by USB to the master board, where the firmware, having handled it, makes the definite LED light by the definite colour. Inside the box there 10 LED-modules each with a 70 cm cable attached. These have to be plugged into the main unit which powers the LEDs. 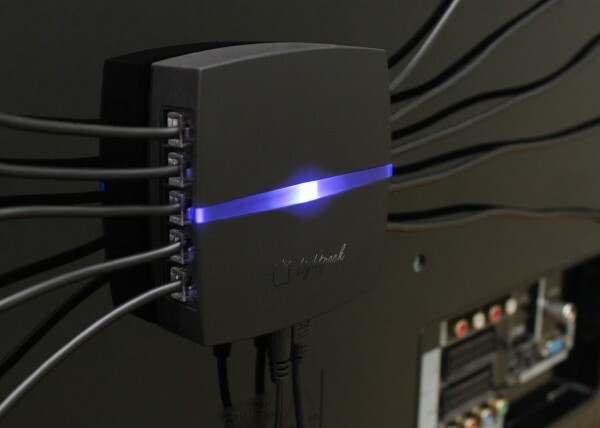 A micro USB cable is used to connect the main Lightpack unit to your PC from which it will receive data regarding which colours to show. The unit is installed by sticking everything on the backside of your monitor. I installed it on a Dell U2410 monitor. The process is fairly simple, but make sure that you clean your monitor first properly, otherwise the adhesive will not work well. Arranging all the cables can be a bit more tricky, but with a bit of patience and some cable ties you will come a long way. Installation is completed by installing the software on your computer. In the next section this will be discussed. 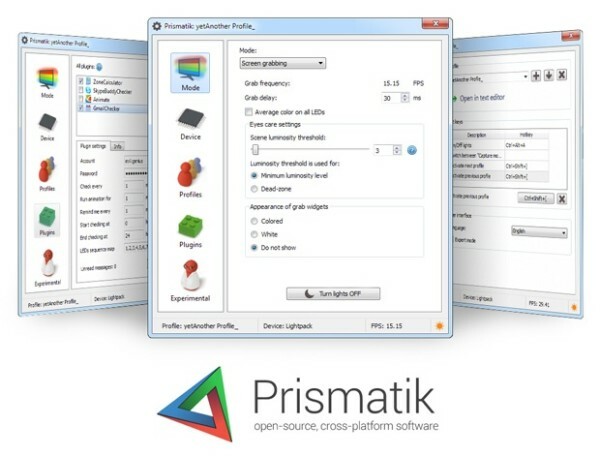 Prismatik is the name of the software which is used to determine which colours should be showed by the Lightpack. If desired there are a lot of options which can be changed to alter the behaviour of the LEDs, but the basic set-up is pretty straightforward. You enter the location/area where you have stuck the LEDs on the backside of your monitor and you are good to go. Since the software has to run in the background it will eat up some resources, i.e. CPU power. My computer features a Intel Core i5 4460 processor and I haven’t noticed any performance loss, but I can imagine that older computer might experience a bigger performance loss. When in doubt you can always install the software before ordering the hardware to see how it works. When you turn on Lightpack for the first time it can be quite impressive. Initially I was looking more at the effect that the LEDs were generating than my screen, but over time you will start to notice it less. After a while you will only notice that the effective size of your screen has increased without seeing the Lightpack LEDs. I was pleasantly surprised what a difference it makes to have additional light behind my monitor. Eye strain is certainly reduced due to the fact that the light source you are looking into is bigger. In the movie above (provided by Lightpack) you can see how Lightpack works when watching movies. A similar effect can be achieved when one is in Photoshop or Lightroom, but for best results the capture areas of the LEDs should be changed to the location where the photo is displayed. Otherwise Lightpack will only capture the dark colours of the Lightroom interface. The effect of Lightpack is the most significant when the room where you are working in has little to none ambient light. 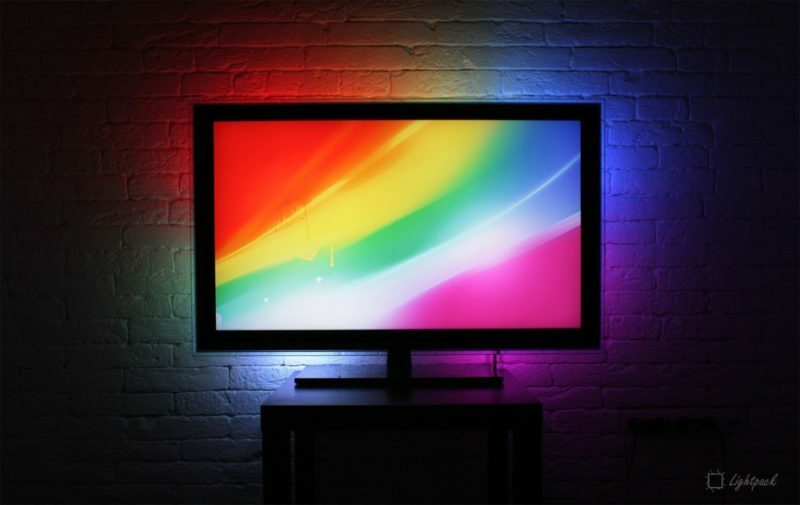 More ambient light will limit the effect of the LEDs stuck behind your monitor because the LEDs lose their ability to overpower the ambient light. In a dimly lit room with a single other light source from the ceiling I found that the effect that Lightpack generates is still quite immersive. There is no need to turn off all the lights in the room. For these dark winter days the Lightpack certainly has some added value to your comfort. I am quite pleased with the result that it achieves, but in the end it still is a gadget. Without Lightpack you are still able to edit your photos and I doubt it that the result will be any different. The added comfort that Lightpack offers can also be achieved by sticking some single colour LEDs behind your monitor, but would result in a much less immersive setup. 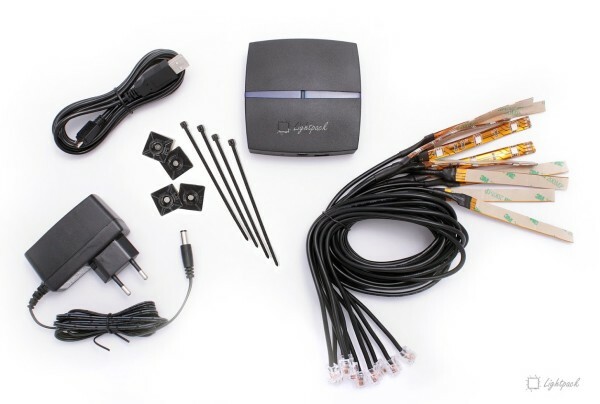 One Lightpack set is limited to 10 LED-modules, which is sufficient for most single monitor setups. Lightpack will also work with multi monitor setups, but then might require additional hardware kits which would increase the price. When considering the price ($65 at the moment of writing) I personally think that Lightpack offers great value for money. The hardware is well built and easy to install. 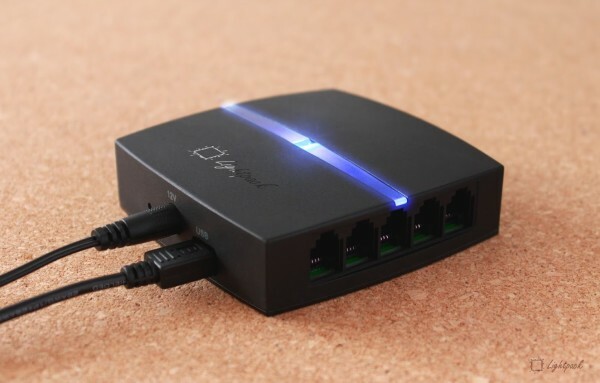 Concluding, Lightpack is a great gadget for a good price. I think you have to be a bit a geek in order to love it, but I know many photographers are gadget loving geeks and they will love it. The Lightpack can be a great gift to these type of people since it does not break the bank, or simply as gift to yourself. It is really cool, but not an essential piece of gear.